MSA manages three schools: Baxipanch Sharda Mandir primary school, Eklavya English School and Vivekanand High secondary Vidyalaya. In these schools we continually organize numerous events and activities to tighten the bonds between teachers, students and ex-alumni. Many have already graduated and started work in different fields. For 1st through 4th grades of Baxipanch Sharda Mandir, a new method called "STEP UP" of teaching & learning has been introduced. We adopted this approach from MAA Foundation of Vapi. The entire curriculum is designed and implemented to deliver the contents in the form of various activities. Teachers monitor the progress of each child in the form of steps completed. STEP UP approach advocates constantly reforming, four dynamic groups: "Self Learner", "Peer Group Learner", "Partially Teacher Supported" and "Fully Teacher Supported". This allows the "Self Learners" to breeze through the curriculum at their own pace while the teacher can focus attention on the "Teacher Supported" group. In addition, we have introduced "Co-Curricular Activities (CCA)" and "Team/house Competitions" for grades 1-8 at Baxi Puch. Students in each class are divided into 6 groups/houses. Each month the six teams compete with each other in 360o activities such as curricular, sports, GK, elocution, debate and even school gardening/earthworm farming. The idea is to inculcate various qualities like competition, collaboration, self-discipline, leadership, sportsmanship etc. This learning system is based on the Scandinavian school system, which ranks highest in education. Not surprisingly our new system has proven itself. 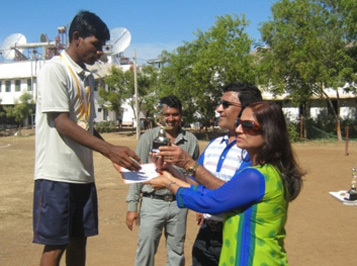 Our students participated in Khel mahakumbh (sports events) and collectively won cash prizes in value of Rs. 33000! Students of all standards are equally grouped into four houses, e.g., Aryabhatt House, Chanakya House, Shivaji House and Vashistha House. These houses are given different colors for their House T-Shirts. Every week on Saturday Inter-House Competitions are organized among four houses. 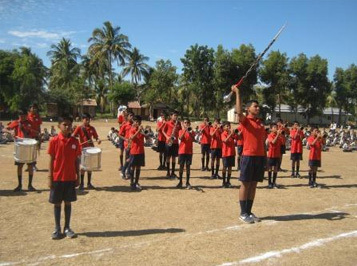 House masters and their associates train the children as per annual schedule of house activities / competitions. Every house is lead by Captain and Vice Captain and along with School head girl / boy, they become part of students' council. This council plays a major role for smooth functioning and development of the school. Each house is awarded points as per their rank. Suppose, Inter house quiz contest or Rangoli is organised and Shivaji house children got 1st place and Aryabhat house children got 2nd place so 5 and 3 points will be awarded to their respective houses and prizes (Medals / Trophies) will go to children. In this way at the end of the academic year, house which scores highest points will be awarded by Rolling trophy. Additionally, students will get their medals and certificates as per participation and result. Students will remember their house names even after they leave the school. House system creates a sense of responsibility, belonging, leadership, competitive spirit, team work, sharing and caring among the children. No Ashramshala in the entire state of Gujarat has such a system. The annual Sports Meet was organized on 29th December 2015 at Vankuva, where all three schools Baxipanch Sharda Mandir, Eklavya School, Vivekanand Vidyalaya had participated. This year VTC also took part in few events. For the first time the school band was introduced and this year house-wise march past was also improved. Shri Raj and Sangita Shah were kind enough to distribute the prizes to the winners on this occasion. Furthermore they announced a scholarship for higher education purposes. This year three students are receiving support by this initiative. MSA parivar would like to thank them for this noble cause. 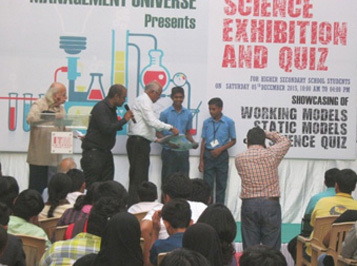 In a science exhibition organized by ITM Universe campus our students had prepared one project using ROBOTICS platform ie. "Energy saver visitors room". Out of 87 schools our children got 2nd place in tie breaker. Parul Rathva of 9th grade was selected to represent Gujarat at National level in 400mt. race. Pargi Panaj was once again selected for Kabaddi to represent Gujarat state at National level. At present, Khelmahakumbh event is going on and so far Eklavya students have collectively won cash prizes approx. Rs.3,40,000 in various events. Shri Rajendrabhai, our new sports teacher, got 2nd place in a national swimming competititon held by the Indian Navy at Jamnagar. Reliance company came forward to sponsor him for the next competition which will be held in May in Japan. He has signed a contract for five years earning Rs. 40,00,000. Lastly we hosted our very first Alumni meet of Vivekanand Vidyalaya which was organized on 10th January 2016 at Vankuva campus. Many former students had participated with a lot of emotions and were happy to remember their golden school days which they had enjoyed at Vankuva. Many students had returned to campus after a long gap but still remembered and appreciated values and caring nature of teachers and MSA in their own development. Among them were teachers, bank managers, C.A., disciplined farmers, social workers, team managers and many more. It was a very emotional moment for all of us at Vankuva to listen to them and discuss and develop future programs. We hope to continue this meeting every year.